Taking part in a sport means that one must acquire the relevant skills: mental, physical and strategic. 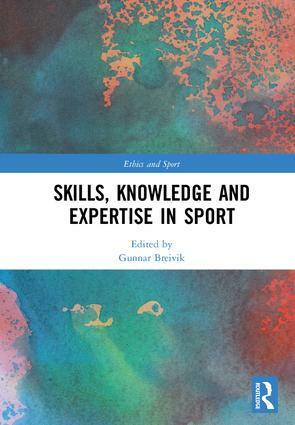 This book presents a new perspective on the role of skills, knowledge and intentionality in sporting contexts, examining how these skills and practical 'know how' can be perfected to a level of expertise. Contributors study broader trends of how we can best understand the role of skills, as well as using case studies of expertise to add depth and nuance to existing scholarship. This book was originally published as a special issue of Sport, Ethics and Philosophy. 2. Skills – do we really know what kind of knowledge they are? 6. What can the parkour craftsmen tell us about bodily expertise and skilled movement? Gunnar Breivik is Professor Emeritus of Social Sciences at the Norwegian School of Sport Sciences (NSSS). He is former Rector at the NSSS and has been president of the International Association for the Philosophy of Sport. His teaching and research include philosophy of sport, as well as empirical studies of risk-taking and elite performance.